Adar - Pisces is a month full of happiness and delight. In the associated swirls of fish and water, we see the joy of life. Still in the depths of winter, we see the distant edge of the bloom of spring. This is a month to celebrate. The month of Adar - Pisces roughly corresponds to February in the Gregorian-Secular calendar. In the video on the left, we see a live turtle interacting with the zodiac symbol of the fish, reminding us of the connections of all water life. As the turtle is often a symbol of the month of Cheshvan-Scorpio, the connection with the period just before the harshness of winter is recalled in this month just before spring. The center video begins with a mosaic on the floor of the ancient synagogue of Ostia Antica, dating from the 1st century C.E., in juxtaposition with the mural from the Stanton Street Shul. 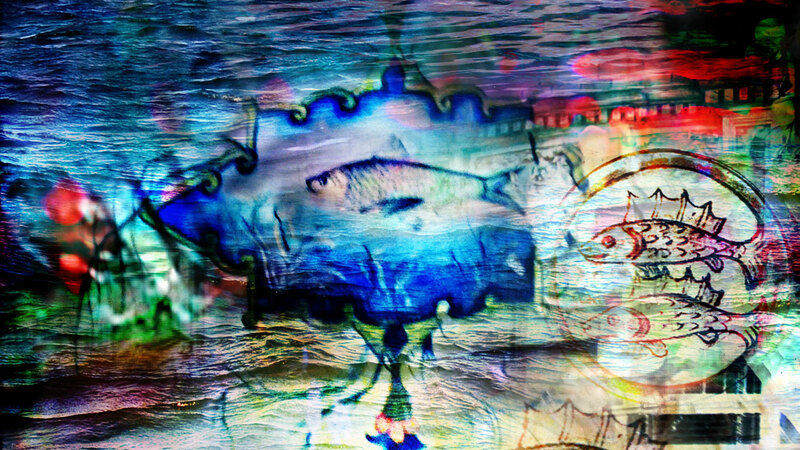 Swimming through it all is a live fish that looks remarkably similar to the fish in the mural. The video on the right is a view out the window of a building on Orchard Street on the Lower East side, which fades into the windows of an Eastern European house. The shift in scenery echoes the memories that are still with the Eastern European immigrants.